According to the Outdoor Foundation Participation Topline Report of 20111 , biking ranks as the second-most favorite outdoor activity. Cycling has existed for around 200 years and supporters of bike-friendly lanes, initiatives, and activities grow each year. Many cities like New York and Portland have adopted laws that support cyclists, including introducing bike lanes into their roadways. While biking is both fun and healthy, it comes with its share of risks. Cyclists are unsafe on roads that offer little protection from cars or trucks. 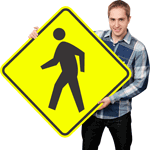 There is also the danger of falling which could result in head injuries. This hazard has prompted the promotion of bike helmets in many countries, and it is now common to see helmet and bike lane legal initiatives across hundreds of cities. Safety is not a new concern for the cyclist. Since they were first introduced, bicycles have inspired cyclists as well as created fears regarding road safety and cycling precautions. The two-wheeler is used by people of all ages, from seven-year-olds just leaving behind their training wheels to adults driving to work. While everyone is at risk when operating any type of vehicle, knowing the dangers and taking safety precautions are some of the biggest steps you can take to ensure a safe ride home. 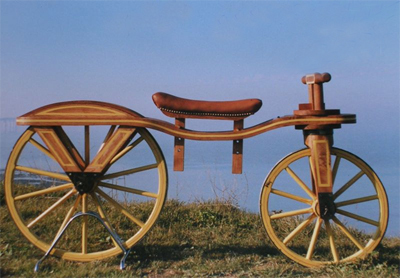 The ancestor of the bicycle, the Drasienne had two wheels but no pedals. It was moved by foot power. The exact origin of the two-wheeler is unclear, but there are a few sources that laid the foundation for the modern bike. In 1818, Baron von Drais of Paris introduced a two-wheeled contraption he called a "Draisienne,"2 which did not have pedals. Popular among wealthy young men, the bike was similar to the Flintstones’ car: foot-operated. Copycats followed and the hobbyhorse became a popular hobby – great for fun, but not terribly useful for any real travel. Velocipedes were the next personal vehicle. They had a large front wheel and a smaller back wheel, and the front wheel was operated by pedals. Unfortunately, there large wheels were inefficient and difficult to manage. While attaining a sort of cult following, velocipedes were never adopted with widespread use. 1884 – First so-called safety bicycle invented in 1884 is the prototype of the modern bicycle. It is the basic design of today’s two-wheelers. It wasn’t until J.K. Starley and Sutton introduced their Safety Bicycle in 1884 that a modern bike existed. 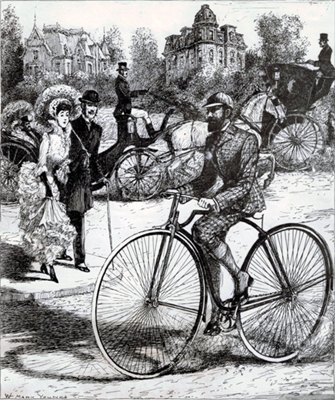 Their bicycle had much smaller wheels than the velocipede and the cyclist sat between the two wheels using pedals and a chain to control the back wheel. The frame was sturdy and was thus adopted for use by women and children, leading to a growing popularity of bicycles in England, the United States, and Canada, all of which had bike patents filed in the late 1880s. New York City 1939 – Students demonstrate the ability to remain between the two lines. Control of the bike shows the student is ready to take to the New York streets. Bicycles grew in popularity and became a regular part of urban living as they provided a simple alternative to automobiles. 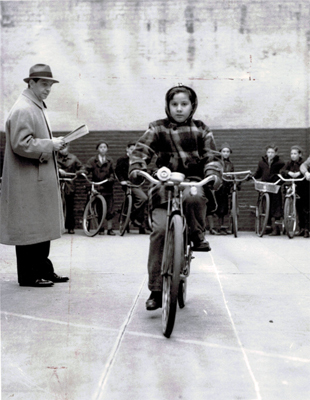 The photo above is from a New York City bicycle safety class in 1939. Once bikes had been mainstreamed into daily life, the need for safe riding became apparent. Children were taught how to share the road, including the importance of hand signals. In the straight line test, for example, students had to stay between the two chalk lines to simulate a traffic lane. The ability to remain in control and stay between the two lines showed competency with the bicycle and meant riders were ready to take the road. Bicycle safety for most of the 20th century focused on knowledge of traffic rules and of controlling the bike. 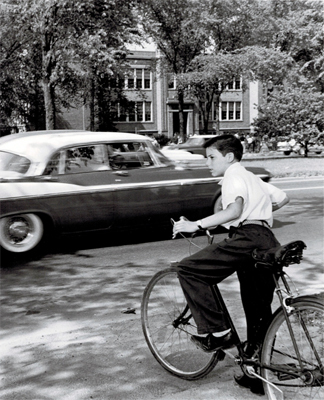 This picture, from 1959, shows a twelve year old boy demonstrating how to properly enter traffic on a bike. Learning to be mindful of cars is the most important aspect of bike safety. Jun 28 1959—Alan Fortunate, 12 years, shows the proper way to enter street from alley with moving traffic. Yet another picture, from the 1950s, shows a young boy learning sign regulations from teachers and a police officer. This type of instruction was considered important for any cyclist on the road, but changing times soon led to new opinions on the most important aspect of bike safety. 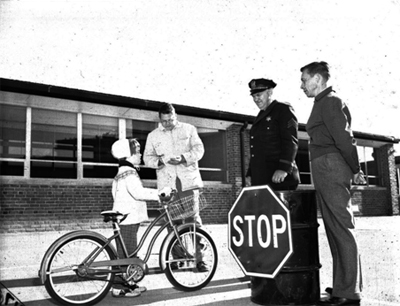 Here a young boy learns the rules of the road with a teacher and police officer explaining stop signs. While cycle paths were built as early as 18953 , they were neither popular nor widespread. The earliest known bike path was the Ocean Parkway in Brooklyn, NY. Construction was planned for many bike paths, but bikes did not remain a common method of transportation and the plans were abandoned. Cycle paths continued to pop up around the world, but it wasn’t until the 1960s that bike lanes gained popularity in the US. During the 1960s and 70s, biking became synonymous with healthy living and was strongly endorsed. Places like Davis, California fought to add bike lanes to their infrastructure. Many believed that adding bike lanes would increase road safety, especially by making drivers of motorized vehicles more aware that they were sharing the road. As bike lanes increased, many cyclists took to the street. 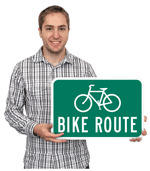 Bike signs sprang up along roadways acknowledging the importance of being mindful of all moving vehicles, be it cars or bikes. 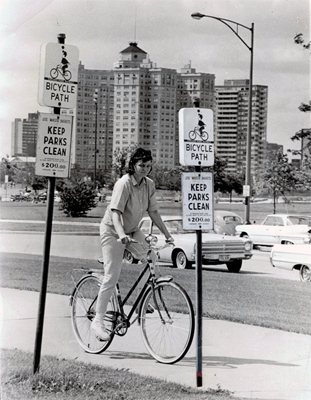 July 2, 1965-Bike lanes sprang up all around the US, as did signs to accompany them. However, while safety was a huge concern, helmets were not yet in vogue, reflected by both the helmet-less rider and the signs. While bicycle safety was always a concern, helmets were not introduced until the 70s. Originally, they were much less effective than motorcycle helmets because the differences in the two types of activity required bike helmets to be lighter, thinner, and more ventilated. Due to comfort concerns, helmets originally did not provide the kind of protection as that they do today. In 1975, Bell Biker4 released a helmet with a polystyrene foam liner and a hard shell, considered to be the most effective and commercially successful helmet of the decade. Helmets like these gained commercial success when they were released in the 1970s. While at first the helmet industry was centered on product competition, it soon began to focus on safety. Studies began to show that helmets may be useful in preventing head injuries. Since then, campaigns have burgeoned that encourage cyclists to don protective gear. Some states have made helmets mandatory for all riders, while others only enforce a helmet law with children. 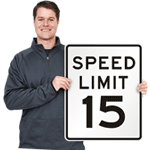 Today many signs show bikers wearing helmets to encourage safety practices when cycling. 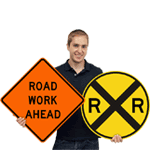 In the past decade, one of the clearest indicators of helmet initiatives was a shift in signage. While the earlier picture of the Foster Ave bike path shows signs of riders without helmets, (not to mention a real helmetless rider) bike signs today, like the one above, typically show the rider clearly donning head gear. 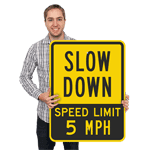 These signs provide a lot of very important regulation and reminders on the road, but also covertly stress the importance of helmets. Whether it is a right or a responsibility, it is important to remember that riding with care and respect can protect not only you but others on the road. These bike signs are the best indicator of this by providing many shades of safety when posted from helmet wearing to lane sharing. Regardless of what the signage shows, many people stress that it is their right to refuse to wear a helmet. It has become a controversial topic5 with people questioning the validity of helmet safety. While the evidence is mixed, the real issue with bike safety seems to be a decrease in safety instruction due to an increase in helmet campaigning. A more level approach seems to be increasing the focus on traffic laws and rules, and educating cyclists on how to best avoid accidents and injuries well before a helmet is necessary. Of course, because roads are unpredictable and can never be completely safe, a helmet is a useful second line of defense.Furthermore, as a favorite activity for millions of people, bike safety should not be taken lightly. 1 Outdoor Foundation, . "Participation Topline Report. "Outdoor Recreation.(2011). http://www.outdoorindustry.org/images/researchfiles/OIA_Participation2011Topline.pdf?133 (accessed June 8, 2012). 2 Monaghan, David W. Canada Science and Technology Museum, "Cycles." Last modified 2012.Accessed June 8, 2012. http://cstmuseum.techno-science.ca/en/. 3 Franklin, Jonathan. Cycle Craft, "A History of Cycle Paths." Last modified 2006.Accessed June 11, 2012. http://www.cyclecraft.co.uk/digest/history.html. 4 Bicycle Helmet Research Foundation, "Cycle Helmets: An Overview." Last modified December 2011.Accessed June 11, 2012. http://www.cyclehelmets.org/1139.html. 5 Bicycle Helmet Research Foundation, "Contradictory Evidence About The Effectiveness of Bike Helmets." 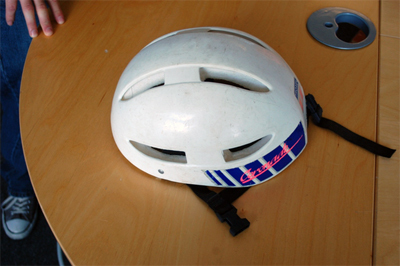 Last modified December 2011.Accessed June 11, 2012. http://www.cyclehelmets.org/1052.html.